According to my rabbi, prayer is a place to gather the strength to change. If there is an intersection between prayer and meditation, that intersection is the Mourner's Kaddish. Kaddish is a prayer of refraction and repetition. The language is not beautiful but it is strong: a series of anapests and a blend of a resuscitated language, Hebrew, and a language long dead, Aramaic. The words clunk along, repeating and repeating the same sounds and the same thudding rhythms. Here's the rule - These words must never be spoken alone. 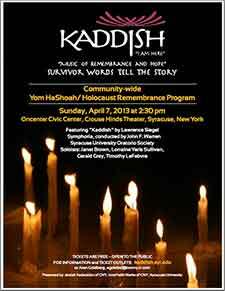 Kaddish must be spoken aloud in the presence of others. There are times I can barely get through the words without choking and there are times when I chant the prayer so mindlessly I cannot remember whether I've spoken out loud. It is where the living come to recite and to witness. I do not recite Kaddish for the meaning. I recite because I am here and this is the sound of my voice.